The Slash/Kennedy collaboration started from intuition. "I contacted him out of the blue, sent him one of the songs I was working on which turned out later to be ‘Starlight'. After Myles contributed his ideas and sent it back to Slash, creative forces congealed. "I went, ‘Wow, now that'sreally good,” recalls Slash. "I played it for Eric so we flew Myles out to track it and this unassuming mild mannered guy shows up, similar in demeanor to me, sort of quiet, not really explosive in personality. He then nailed "Back from Cali” it was like, ‘You ready to go on tour with us?' I was so happy when he accepted the offer.” For the Boston-born lead singer of the Florida-based hard rock quartet, Alter Bridge, the gig was an opportunity to expand his personal portfoliowhile exploring some musical synergy with an artist he'd long admired. 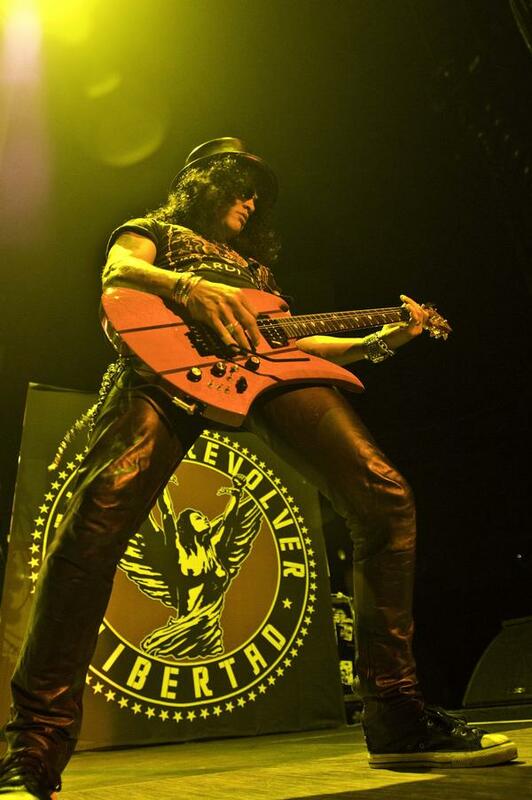 Much to the delight of old and new fans, Slash's resume builds along with his worldwide fan base. Since making history and amassing global sales in excess of 100 million units with Guns N' Roses, returned with Slash's Snakepit in 1994, followed by Velvet Revolver's two hit LPs, 2005'sContraband (for which the single, "Slither” won a Grammy for Best Hard Rock performance) and 2007's Libertad. Finally, Slash reemerged with his groundbreaking, guest-star studded 2010 solo debut. In 2011, Slash was honored by the Hollywood Chamber of Commerce who named him as an official selection to receive a star in 2012 on Hollywood's iconic Walk of Fame. After making numerous session appearances and lending his laid-back, six-string genius to an eclectic mix of artists which include Michael Jackson, Ray Charles, Stevie Wonder, filmmakers Quentin Tarantino and Darren Aronovsky; not to mention Guitar Hero III: The Legend of Rock and co-authoring a bestselling memoir–the question begs: What's next for the London-born, L.A. schooled kid who discovered his musical soul when his father played him the Beatles, Stones and Yardbirds? –Lonn M. Friend author of Life on Planet Rock (2006) and Sweet Demotion: How an Almost Famous Rock Journalist Lost Everything and Found Himself (2011).